Everyone’s collective effort really produced a wonderful book. Throughout the process, owner and publisher Marian Calabro was very positive, detail-oriented, organized, and she provided solid recommendations. . . . The entire process took over a year and a half to complete, and the final result was outstanding – from the writing and editing to the overall design. We enjoyed working with you all and would recommend CorporateHistory.net to any company interested in embarking on such a journey. This project offered the chance to publish a more conversational type of history book — one where readers would find as many photos as they did stories, and one where the individuals and groups who formed the backbone of the Hospital literally came to life. 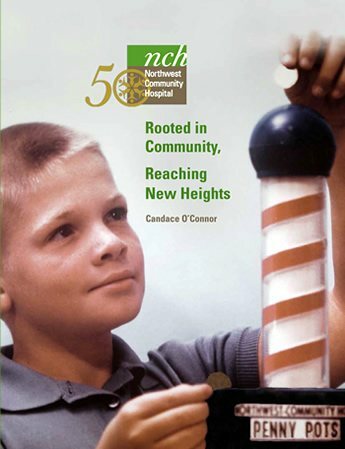 NCH: Rooted in Community, Reaching New Heights tells the remarkable story of Northwest Community Hospital (NCH), established in 1959 by citizens of Chicago’s northwest suburbs. That fledgling Hospital has grown into a large, award-winning institution with state-of-the-art technology that its founders never imagined. 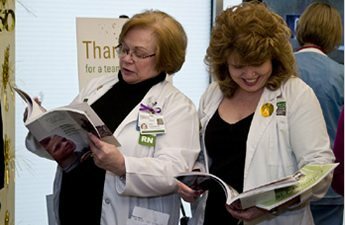 NCH is a three-time Fortune® magazine “100 Best Companies to Work For” honoree and is one of only 3 percent of healthcare organizations nationwide to earn the Magnet Recognition for Nursing Excellence. Despite its medical sophistication, NCH has never forgotten its roots. The Hospital remains an independent, nonprofit healthcare provider, firmly focused on the area it serves. Richly illustrated with more than 400 photos and artifacts, this 160-page history brings to vivid life the many people and events that made NCH’s present success possible. NCH raised funds for its opening by placing “penny pots” in local stores. These donations, in small but steady amounts, swelled the Hospital fund and created the broad community support that remains an NCH hallmark. 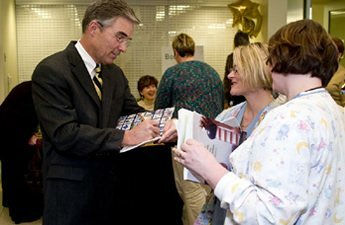 Hospital CEO Bruce Crowther signing books for NCH nurses; author O’Connor signing books in background. Staffers at the Hospital’s book party. 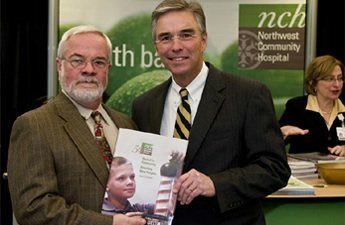 Area resident John Welzenbach (left) with CEO Bruce Crowther. At age 8, John was a poster boy for NCH’s initial fund-raising efforts. He’s the boy on the book cover.